Keep calm and carry on font here refers to the font used in the poster of Keep Calm and Carry On, which was produced by the Government of the United Kingdom in 1939 during the beginning of the World War II to raise the morale of the British public. 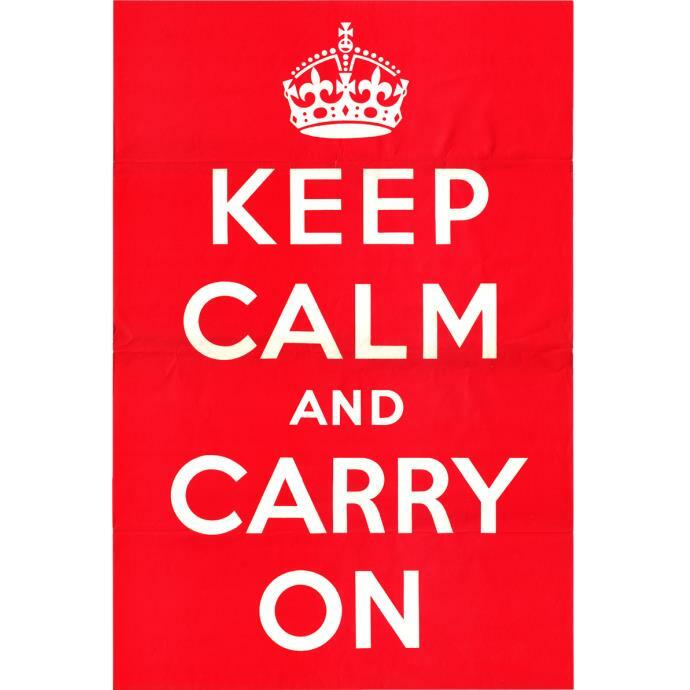 The poster features an icon of crown with the text “KEEP CALM AND CARRY ON” portrayed in white on a red background. The font for the text is very similar to a font called Keep Calm Medium, which was actually inspired by the poster. Keep Calm font family is now available in Light, Regular and Medium, each with an italic version. Keep Calm fonts are commercial fonts but you can download the Keep Calm Medium here and use it free for personal purposes. For other fonts in the family and commercial uses, you will have to purchase licenses from K-type. Update: you can now create a keep calm poster by using our keep calm poster generator, click here and start creating one. The Keep Calm font identified above is not available for free, please follow the link above and purchase the font. Meanwhile, you can take a look at our collection of fonts for cars, pop music and apparel as well as round-ups of new & fresh fonts around the web. In addition to Keep Calm, It seems we can’t find other examples (logos, movie posters, album covers etc.) of Keep Calm typeface in use.